What is a clock? This is a physical process. There are many physical processes on any object. then I began to look for errors in this theory. After I found these errors, I tried to make them as clear as possible, clear and accessible to a wide audience. One such error is the statement that a body moves in a gravitational field so as to spend a maximum of its own time on its way. Richard Feynman, in his lectures on gravitation, replaces the body for hours (see here). He does this in order for readers to better understand the meaning of the general theory of relativity. Such an absurd Feynman would not have written. 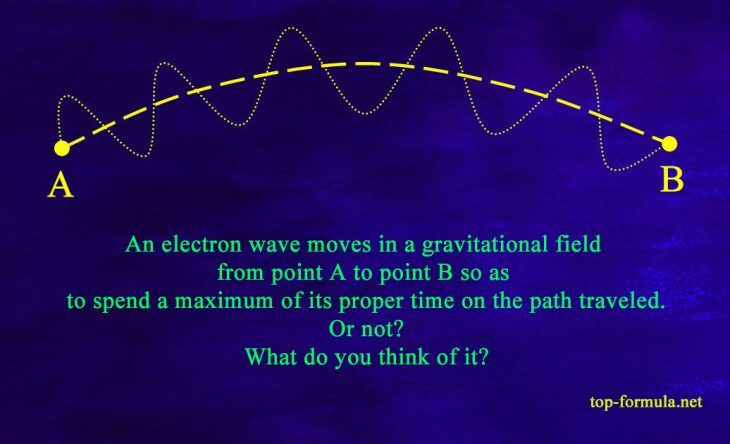 Does an electron move in a gravitational field differently than a normal object? No. Under identical initial conditions, both a normal clock and an electron will travel along the same trajectory. The clock will move so as to spend a maximum of its own time. How will the electron move? Will it spend also the maximum or minimum? Or maybe this option: the electron will spend a maximum of its own time, but the phase difference of its wave function will be minimal :). I was very interested in what kind of answer the general relativity supporters would choose. I understood that there is a serious flaw in the foundation of the general relativity. Perhaps, I misunderstood something. Maybe the general relativity supporters know about this problem and know how to solve it. Even if you are 100% sure of something, you always need to listen to the opposite side. So I decided to find out what the general relativity supporters are thinking about this.